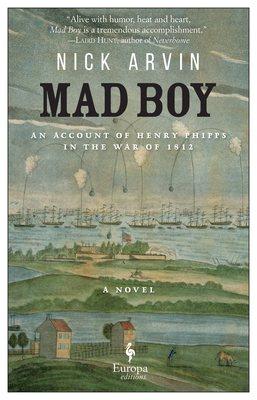 Mad Boy is a rollicking, picaresque novel about family and perseverance set during America's forgotten war of 1812. Young Henry Phipps is on a quest to realize his dying mother's last wish: to be buried at sea, surrounded by her family. Not an easy task considering Henry's ne'er-do-well father is in debtor's prison and his comically earnest older brother is busy fighting the red coats on the battlefields of Maryland. But Henry's stubborn determination knows no bounds. As he dodges the cannon fire of clashing armies and picks among the ruins of a burning capital he meets looters, British defectors, renegade slaves, a pregnant maiden in distress, and scoundrels of all types. Mad Boy is at once an antic adventure and a thoroughly convincing work of historical fiction that recreates a young nation's first truly international conflict and a key moment in the history of the emancipation of African-American slaves. Nick Arvin's first novel, Articles of War, was named one of the best books of the year by Esquire, Detroit Free Press, Rocky Mountain News, and The Independent. It won the Rosenthal Foundation Award, the American Academy of Arts and Letters Boyd Award, and was selected for the One Book, One Denver reading program. His second novel, The Reconstructionist, was described as "thrilling and soulful" by David Wroblewski and was selected by Amazon as a Best Book of the Month. Arvin's fiction has appeared in The New Yorker and numerous other periodicals. He is a graduate of the Iowa Writers Workshop. He lives in Denver.